The green and lush fragrance of culantro is one of my favorite rainy day smells. In the kitchen garden I kept at my late grandmother’s house in Mayagüez, Puerto Rico, I had a vigorous crop and whenever it rained, the drops activated the fragrance, the scent pervaded the house, and I got hungry! Without culantro (which we call recao), Puerto Rican food just isn’t as vibrant; it can’t taste quite like abuela’s. It is integral to sofrito, the starter to so many recipes, including beans, soups, stews and rice dishes. It is the equivalent of the French mirepoix, that combination of sauteed/roasted onions, carrots and celery that is the base for so many Gallic dishes. Unfortunately, culantro is not as well known in the U.S. and doesn’t grow super-well in my planting zone, although I have had some small successes over the years (Thanks to Vic Muñoz for her growing tips). So I hit the local Latin supermarket on occasion and buy some pre-cut leaves from Costa Rica. Because once cut, recao loses its potency quickly, I use twice as much as I would if I had just gone out back and snipped some. And because it is sold by quantities much bigger than I need for a single dish, whenever I do buy it, I make enough sofrito to freeze. The same goes for ají dulce, the non-spicy small pepper that looks like a habanero, but isn’t at all spicy. I buy a bunch at once — along with the recao — and make sofrito to freeze. You have to be careful and taste it before adding it to the sofrito, because sometimes the store makes a mistake and labels the hot ones as sweet ones, or, I’ve been told, ají dulce planted too closely to ají bravo (angry, aggressive) will take on the spiciness. I can actually smell the heat when cutting habaneros (also called scotch bonnets); the volatility is no joke. The following recipe is for those who have access to these products. If you don’t have a Latin market nearby, investigate the Asian/Indian markets, as they too use these ingredients. There are a number of prepared sofritos widely available (Goya makes several, for example) which will work in a pinch, but I prefer the fresher taste of my little frozen cubes. The recipe is also completely flexible; I don’t include garlic, because not all my criollo dishes require it and I can always add that later; my purpose here is to salvage what I can of the ingredients that are harder to obtain. You can also add red bell pepper or chopped tomato. When you actually use the sofrito, you can cook it with additional ingredients; many criollo recipes call for sauteing with ham, for example. I really hope you are able to make this; for those unfamiliar with true Caribbean food, it will be a revelation, and for those of you in the diaspora, it will taste like home. 2 medium cubanelle pepper, halved and seeded. 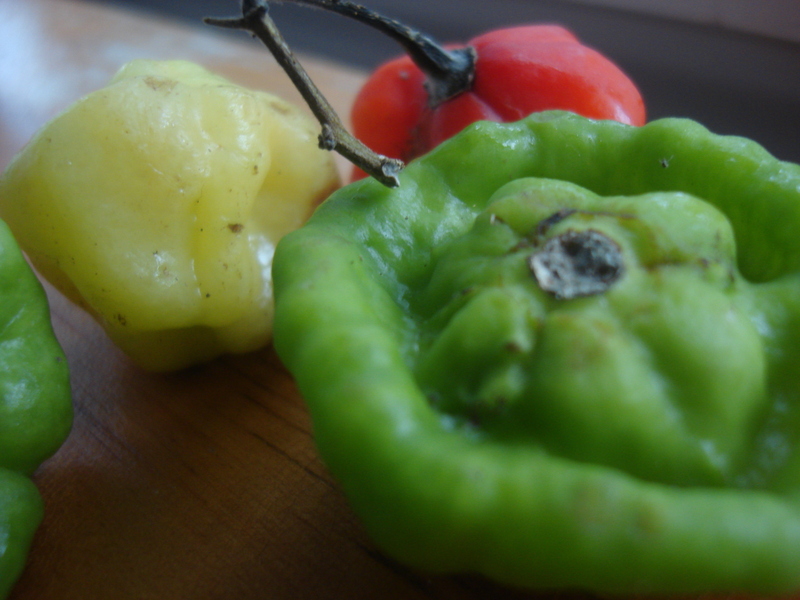 Called pimiento para cocinar in Latin groceries and also called Italian cooking pepper, it is usually pale green, with a thin skin when compared to bell peppers, also much longer and more pointed than a bell pepper. 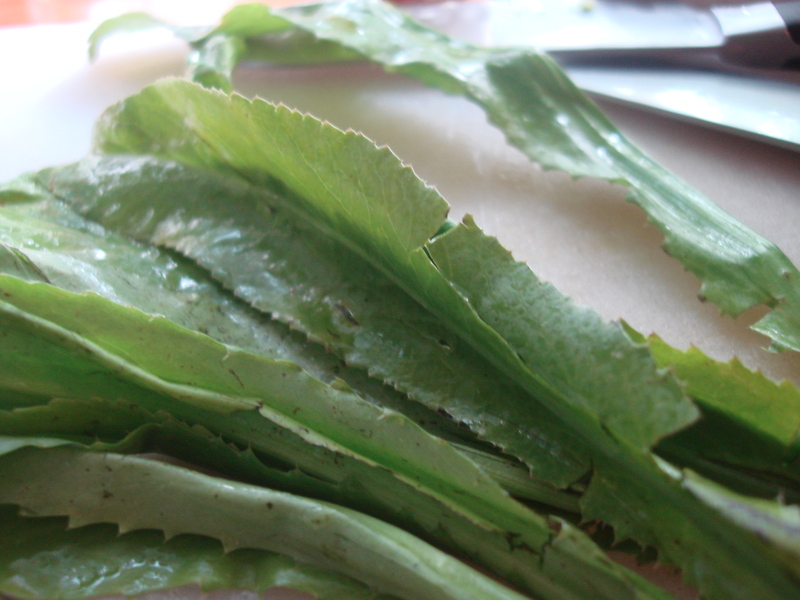 8-10 culantro leaves, roughly chopped. Called hojas de recao in Puerto Rico. Place all ingredients in a food processor and pulse until thoroughly mixed but still slightly chunky. Pour into ice cube tray, cover with aluminum foil or plastic wrap and freeze. You can pop them out when needed, or transfer to a freezer bag. Two to three cubes will season a can of beans (1-2 Cups if using soaked beans from dry). FROM: Ramcharan, C. 1999. Culantro: A much utilized, little understood herb. p. 506–509. In: J. Janick (ed. ), Perspectives on new crops and new uses. ASHS Press, Alexandria, VA.
Oh my goodness!!!! I added 5 spicy little size ajicito peppers (scotch bonnet) to my sofrito batch and it is 🔥 HOT! I use sofrito for my beans, stews and spanish spaghetti sauce…. How many spoonfuls should I use in my dish to play “safe” with the HEAT content? PLEASE…….PLEASE…HELP ME! I can’t afford to throw this batch out and make a whole new batch! Thank you for responding! What an all round well written post..
Love the blog Natalia! Really fantastic!! Going to try some of these recipes. Cheers!